St Martin’s hosts art exhibitions curated by charitable and cultural organisations. The Foyer, Gallery and Courtyard provide a backdrop for these organisations to share their vision with visitors to St Martin’s. Other events and things to do can be found in the events calendar. 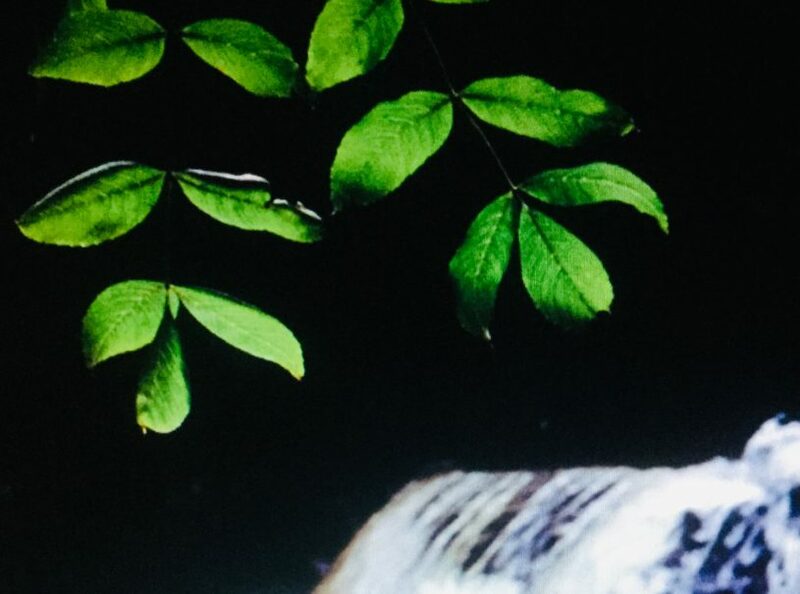 ‘Leaves for Healing’ is a two-part exhibition organised by the artist’s and craftspersons’ group at St Martin-in-the-Fields. During Lent the exhibition runs from 6 March – 20 April and in Eastertide from 21 April – 9 June. The theme is taken from Ezekiel 47:1-12, a vision of a transformed desert landscape. 18 artists from the congregation are showing work, some of which was created in the Drawing Club and art workshops organised by the group. Ezekiel 47:1-12 is a marvellously evocative passage using much natural imagery – water, rivers, sea, swamps, marshes, fish, trees, fruit, leaves etc. The temple, as the place where God’s presence was very real, is seen as the source of new life, water flowing out and into the landscape, transforming the barren, empty desert into incredibly fertile land. In a barren landscape the passage finishes with a wonderful vision of the fruit from the trees that grow being food and the leaves used for healing. We have here a vision of life being released into the dry desert of Ezekiel’s time and encouragement for us to imagine this life flowing into our 21st century context. The exhibition utilises this imagery to explore themes of flourishing, growth, healing and worship. The two halves of the exhibition reflect the transition from wilderness to fertile land. St Martin-in-the-Fields has a collection of historic memorials and art installations by contemporary artists. Catling’s exquisite design references a ‘cross of poverty’: not an ornate object, but one crafted from basic materials by someone with the simple desire to fashion the powerful symbol of the Cross. The starting point is two pieces of wood humbly tied together by a length of string; a third piece of wood hanging from the centre provides an allusion to St Martin tearing his cloak in two and giving half to a beggar. Through casting the cross in a strong yet lightweight aluminium and gilding it in white gold, Catling’s original idea is transformed into an extraordinary emblem of the church. 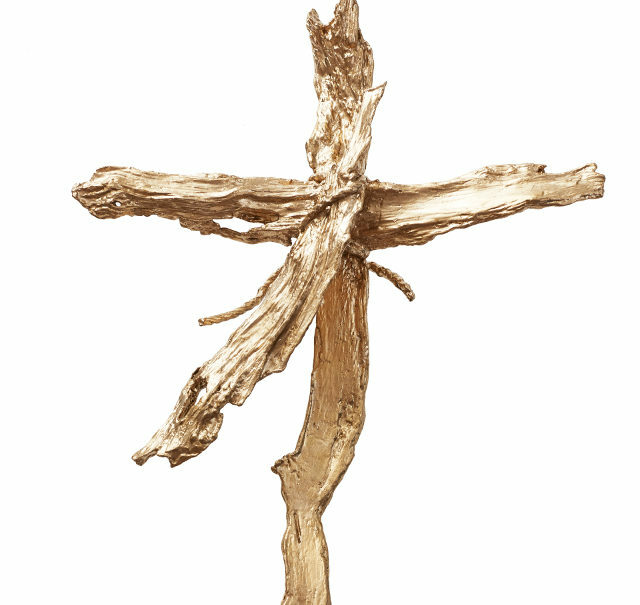 Throughout the process the cross was worked on by hand, creating an original and conceptually complex work. The dedication of the new Processional Cross was held in a special ceremony on Sunday 15 Sept 2013 at St Martin-in-the-Fields. Etched mouth-blown clear glass and shot peened stainless steel frame the East Window was commissioned as part of the Renewal of St Martin-in-the-Fields, our major £36m building project from 2006-2008. Light was a key theme of the project and the East Window was designed to let in as much light as possible while creating a work of art that is uplifting and inspirational. The artist was given a brief suggesting a minimal, possibly monochromatic design would be appropriate and that a potential starting point or subject was that of ‘Jacob’s Ladder’, a story which has had a continuous thread of resonance for St Martin’s. The Altar is designed by Shirazeh Houshiary and Pip Horne, creators of our East Window, and was dedicated at the Patronal Festival in celebration of our patron saint, St Martin of Tours on 13 November 2011. The Altar is at the symbolic and spiritual heart of our church. it is the place where we gather together in communion with one another and with God, and where broken bread and shared wine become the signs of God’s everlasting love for us. It is a sacred space, the place of transformation, the altar upon which we remember the death of Christ and the suffering of the world, but also the place of resurrection and hope. 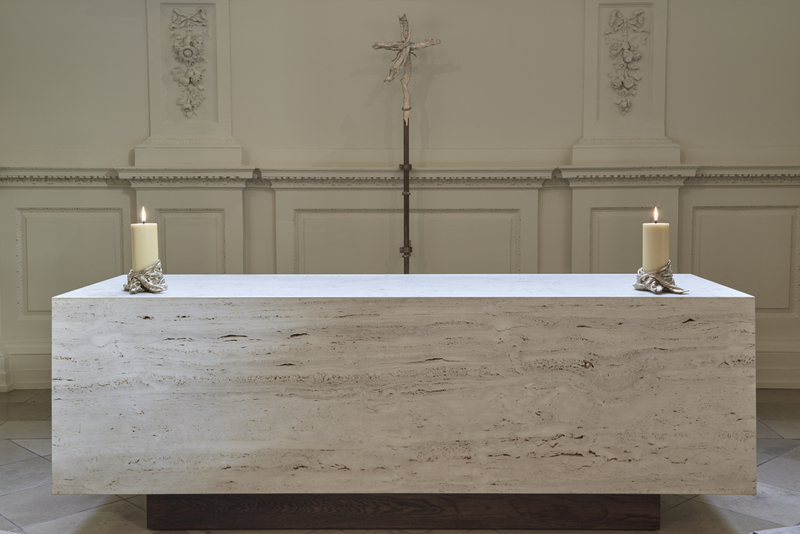 Designed to complement the East Window, the Altar is made from a single block of Travertine Stone that appears to float on a plinth of dark stained oak. These materials have been selected to harmonise with the colours used in the interior of the church. It is gently illuminated by LED lights placed within the hollowed out stone. Created by the monks of Saint John’s Abbey and University in Collegeville, Minnesota under the creative direction of Donald Jackson, the Saint John’s Bible is a union of an ancient Benedictine tradition with the technology and vision of today, illuminating the Word of God for a new millennium of multiple cultures and multiple faiths. St Martin-in-the-Fields was given a Heritage Edition of the Saint John’s Bible by Saint John’s Abbey. The gift was made possible by the generosity of Dan and Katherine Whalen. Created in a series of seven volumes, the bible is used in services in Church and some of the volumes are on permanent display in the Foyer. Prints from the Saint John’s Bible are on display in the Gallery and posters are available in the Shop. Mike Chapman’s beautiful sculpture In the Beginning was commissioned to mark the new millennium and was part of the 1999 Trafalgar Square Christmas celebrations. Carved in a 4.5 tonne block of Portland Stone, this work is now permanently on display at the entrance to the church. 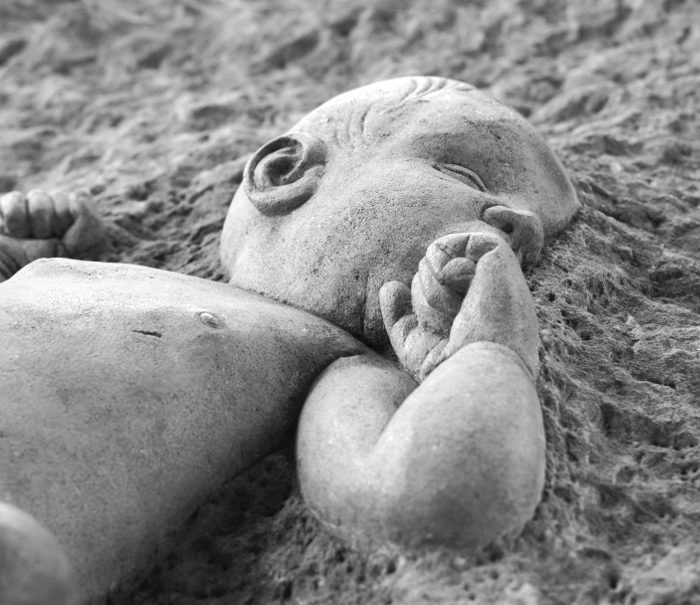 In The beginning is well-loved by thousands of visitors to St Martin’s every year and as the artist said “It seemed to me that a tiny life-size baby craved from stone in such an enormous environment would be the best way to remind us all of just whose birthday we are celebrating”. This oil on canvas by Brad Lochore explores the fleeting essence of an object using the effects of light mediated via cinema and photography. Lochore’s paintings poetically underline the impermanence and fragility of our lives, and remind us that although we may recognize real things in such artworks, they are after all illusory. 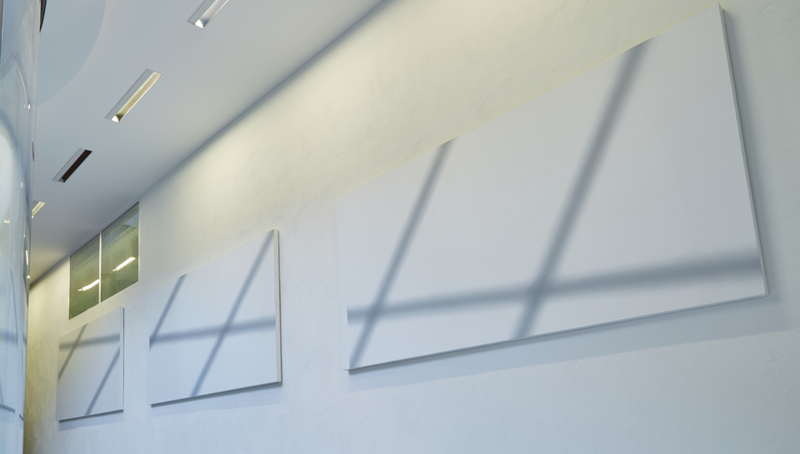 Shadow No 66 (triptych) is on permanent display in the Crypt. 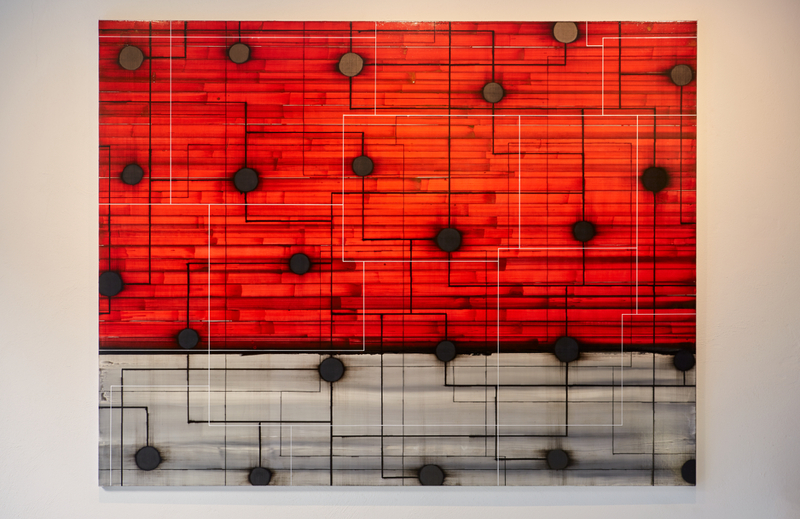 Over the past thirty years, Mark Francis has made paintings of singular optical intensity powerful, apparently abstract combinations of concentrated patterning that explore scientific data and imagery. Recent paintings use a grid structure as a subtle, compositional device; this may explicitly allude to cartographic formations, sound graphs and astronomical diagrams. Always acknowledging his interest in physical forces: the natural or man-made trajectories of particles, matter, data orlight, Francis positions himself, and the viewer, amidst myriad ‘mapscapes’ of invisible spaces and networks. “Parameter is one of a series of paintings created between 2011 and 2014. For further information about the artist visit www.markfrancisstudio.com. St Martin is the patron saint of pacifists but also of soldiers which makes our church a very appropriate home for the memorial to Far Eastern Prisoners of War. 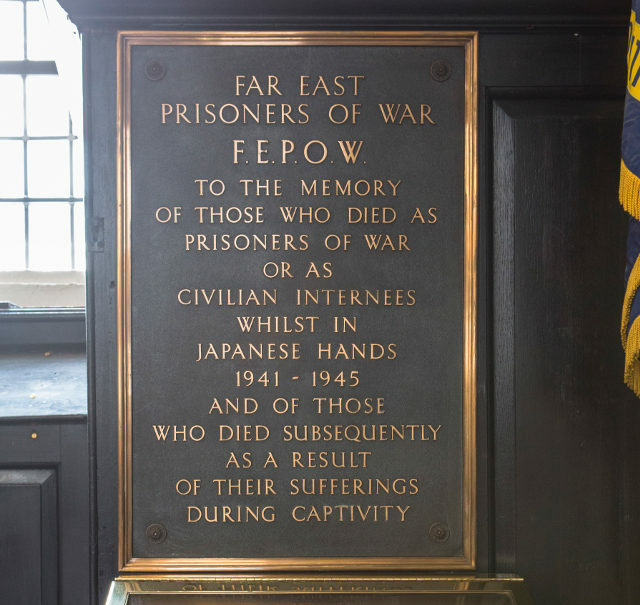 The memorial remembers those who died as prisoners of war or as civilian internees whilst in Japanese hands from 1941-1945 and of those who died subsequently as a result of their suffering during captivity. On display are two blocks of teak, parts of sleepers from the Burma-Siam railway which was built with Prisoner of War labour. The memorial was viewed by HM Queen Elizabeth when she attended a service at St Martin’s in 2015. The service was the centrepiece of the national commemorations for the 70th anniversary of VJ Day and the end of the Second World War. The inscription reads – “At the going down of the sun and in the morning – we will remember them”.